This makes me regret spending money on FEAR that I could have spent on this book instead and gotten better information out of. (Maybe I can afford UNPRESIDENTED next year, or maybe UNPRESIDENTED will be available for loan from archive.org.) FEAR is more useful for receipts vis a vis 2015-onwards bad behavior, and a little bit of White House ghost stories, but UNPRESIDENTED sounds like it's actually useful for understanding where a certain person came from and how they work. As for the current President, I tend to call him rump out of habit. This has the advantage of being harder for robots and far-right supporters to hate-search and harass on social media, if one wants to go there anymore. Presidential biographies really do tend to doctor everything. There are even little books that claim to biographically summarize presidents that boil down to "Har har this one committed genocide but really he had a good sense of humor" and it's just very distorting. If we're never going to confront the past we'll find it very hard to move past it. The book can be preordered on Amazon for $10.99 for the Kindle edition delivered by Dec. 4th. cheap and accessible seems to be the way they are going. Media of all sorts tends to distort the lives of the people they report on because its a medium and the problem is that as MacLuhan said it becomes the message...Our problem as a public is that we really see so little even when this President tweets directly. I know how I tweet and represent myself in the media that I use...I wouldn't like to be judged by whatever people garner from my informal communications.I have ordered my copy...and will see how it reads. I don't have income due to disability, so $10.99 is not actually cheap to me. It's out of my reach. As for distortion, I was referring more to "this fellow committed genocide, but it really didn't mean he was a bad person, let's go into details about all the positive aspects and none of the negative ones." I'm quite aware that you can't fit a person into any medium. If you haven't ordered your copy already, you should preorder it from Queen Anne Book Company (https://americanindiansinchildrensliterature.blogspot.com/) and support a local bookseller! Amy Miller - Ronan, Mt. Debbie, I've a question. Why exactly be it that thou dost not use a capital letter in "Trump"? Is it thy version of LeBron James's and Neil Young's "so-called president" or something? Because I'm not certain as to why thou doest it. 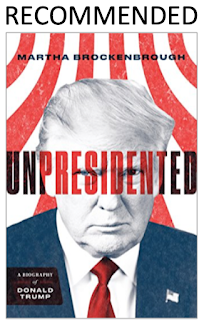 Also, something I should have mentioned earlier--Unpresidented is a great antidote to that bad, baaad book about Trump put out by Scholastic, don't you think?